The day began early this morning with a call from a concerned resident about a Bald Eagle on the ground bleeding. A large stick was through her wing. By seven A.M. I was in the van and on my way to attempt a rescue of the eagle. The drive was beautiful with 3-4 inches of fresh snow decorating the trees and ground. Now that it is April I am trying to enjoy the beauty of it all knowing it will not last long. Arriving at the location some 45 minutes later we found the situation to be exactly what the homeowner reported. An adult bald eagle sat on the ground under an evergreen tree. From her wing came a very large stick. ( See photo) I have no idea how the accident happened. An eagles nest is located directly above where the bird sat. An adult eagle was sitting on the nest and no other eagles were seen or heard in the area. We suspect strongly that this is one of the adults from the nest site. From her size it is likely the female. The eagle ran from capture and there were some anxious times as we followed her across a still frozen part of a lake. Gratefully the ice held me and the homeowner. The homeowners were very helpful in helping corral the bird on a peninsula where we could capture her. We were able to get the stick out of the wing in the field before we transported her to the REGI facility. Once at REGI the injury site was cleaned and evaluated. Her blood work looked good and she is in excellent physical condition. The hole in her wing should heal, but will take some time. She will require physical therapy to make certain the wing keeps mobile. No bones were fractured and that is good news. The prognosis is good that she will be released once healed. Without the help of the homeowners reporting the bird and calling REGI she would certainly have died a horrible slow death. We had a call with more than exciting news about the Sandhill Crane released Wednesday near Wisconsin Rapids. The cranes full story is in the blog below this entry. This crane has become an extended part of many families in that town and they watch her closely. Today there was some exciting albeit intimate news to be shared. The crane and her mate were seen copulating this morning!!! They will be parents this year despite the bad luck of last year. We are delighted for them. Their youngster from last year is still with them and was in the same field while his parents were declaring their affection. The lad is getting an education that may be a bit ahead of his needs. I suspect his close contact with them will change now that they are serious about nesting, but with this pair nothing surprises me. We also have a new pine siskin with a wing fracture. Unlike most siskins this spring, this one does not appear to be suffering with salmonella. That is great news and we hope to get him on his way soon so he can finish his northward migration. 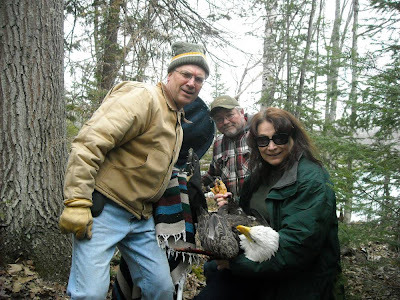 How grateful we are for Marge and her grandson who quickly responded (early on a Sunday morning) and rescued the Bald Eagle that has been a joy to watch and has been a special part of our family for over 20 years. Marge Gibson and the volunteers of Raptor Education Group, Inc. have our praise! Thank you so very much! How grateful we are for Marge and her grandson who quickly responded (early on a Sunday morning) and rescued the Bald Eagle that has been a joy and been a special part of our family for over 20 years. Marge Gibson and the volunteers of Raptor Education Group, Inc. have our praise! Thank you so very much! !